nuClock is a project funded by the European Union within the FET-Open initiative. “FET” means future and emerging technologies, which already describes the mission of nuClock: the development of fundamentally new technologies associated with scientific clocks. What’s driving us is something very fundamental: we want to measure time as precisely as possible. We want to build the best clock in the world! It seems that since ancient times, mankind has been concerned with the measurement of time: just think of the old Maya calendar. Each technological innovation brought about an immediate benefit for society. Understanding the movement of celestial bodies enabled peasants to define the right time for harvesting. Mechanical clocks revolutionized navigation on the sea, while quartz clocks later allowed anyone to wear a watch that would not win or lose more than a few seconds in a year. Today, atomic clocks on board of navigation satellites provide the GPS signals that we use every day. Such atomic clocks measure the energy difference between two quantum states of an electron. Most devices use the single valence electron of an alkali atom, usually rubidium or cesium. Microwave radiation is used to switch between the two states, but this only works if the frequency of the microwave radiation corresponds exactly to the energy difference of the two states! Remember that the frequency of the microwave radiation is directly proportional to the energy that each microwave photon carries and transfers to the electron. The value of this frequency can easily be converted into a time signal using well-known electronics. The best of such clocks are off by only one second in 100 million years. The next generation of atomic clocks are so-called optical clocks. These clocks also measure the energy difference between two quantum states of an electron, but now these states are separated by a few eV in energy, corresponding to the energy of a photon of visible light. Consequently, these clocks do not operate with microwave radiation, but with laser light. While researchers are currently working on ways to remove a number of systematic errors, such optical clocks are already now 100-times more precise than the microwave clocks. To improve the clock performance further, researchers search for quantum states that have an ever larger energy difference (thus increasing the ticking rate of the clock), but that are insensitive to perturbations of the environment. Quite naturally, one might consider two quantum states of an atom’s nucleus as the heart of a future clock, as all energy scales in the nucleus are much larger than those of the valence electrons. Additionally, the electron cloud protects the nucleus from any disturbance of the surroundings, thus eliminating unwanted side-effects that perturb the measurement. In 2003, E. Peik and co-workers suggested to use the nucleus of thorium-229 for such a nuclear clock. This specific isotope has a very unique feature: it possesses an excited nuclear state just a few eV above the ground state. The transition could thus be driven with laser light. This state (called an isomer) is metastable with a lifetime of about an hour, which is also favorable for operation of a clock. Neither the energy of the isomer, nor its lifetime, are known. The measurement of these important quantities is hampered by two unfortunate circumstances: Th-229 is radioactive, and it does not occur naturally. Nonetheless, there is no way around such measurements before a thorium-based clock can ever become operational. To overcome this first road block, the nuClock consortium follows a number of different strategies in parallel. The isomer energy is expected to be larger than the first ionization threshold of thorium, therefore it is wise to work with positively charged ions. Optical clocks based on trapped ions are already well-established, and an adaptation of such devices to the thorium case is the consequential step. The excitation of the isomer can be performed directly with laser light, or, while such laser are only being developed, via a cascade of smaller excitation steps. An ion trap presents the Th ions in a state very well decoupled from the environment. While this is necessary for measurements with ultimate precision, external perturbations from the environment might be tolerated in the initial search for the correct optical frequency. Doping thorium atoms into crystals with good optical transparency is one possibility to obtain a dense ensemble of nuclei, while at the same time holding them securely in a robust container. Direct optical excitation of the isomer might prove to be difficult, as both the required frequency and the linewidth of the transition are unknown. There exists an alternate scheme to populate the isomer: via radioactive alpha decay of uranium-233, which decays into Th-229. A small fraction of the Th-229 daughter nuclei arrive in the isomer state, where they stay for about an hour and then decay further into the ground state under emission of a photon. The wavelength of this photon can then be measured. As a variation of this approach, one may not seek to measure the photon emitted from the isomer, but a series of gamma lines that trace the relaxation of the highly-excited Th-229 nucleus, following the U-233 decay, into the ground state. As the ground and isomeric states are very close in energy, some of the gamma lines should show a doublet structure, where the splitting is a direct measure of the isomer energy. All of these schemes suffer from the limited availability of Th-229 and the long lifetime of U-233, which results in a very slow production rate of Th-229. A mechanism that generates a high flux of Th-229 in both its ground and isomeric state is the light-ion fusion reaction. Here, an accelerator is used to generate a beam of high-energy protons, which is directed onto a suitable target. A beam of various isotopes emerges from the target, containing such quantities of Th-229 that one can perform laser spectroscopy on them. Atoms in the isomeric state are identified by their level structure. All of these experiments operate at the border line of atomic physics, quantum optics, and nuclear physics, and borrow experimental techniques and theoretical concepts from all of these areas. This region of overlapping disciplines is not yet well-explored, and support from theory is badly needed to connect between the otherwise separated fields of atomic and nuclear physics. As with any piece of fundamental research, one cannot predict the technology that will emerge from it. A nuclear optical ion clock, based on the Th-229 isomer transition, has the potential to outperform today’s best optical clocks, given that the narrow linewidth and the reduced systematics can be fully exploited. A comparison of such a clock with conventional atomic clocks could be used to search for drifts in fundamental constants, such as QCD coupling parameters and maybe even the finestructure constant. A solid state nuclear clock might not become the most accurate clock, but it would allow to shrink today’s optical clocks, which require a full-fledged laboratory full of lasers, optics, and electronics, to a mm-sized crystal. This reduction in footprint, cost, and energy consumption seems attractive for next-generation clocks onboard of navigation satellites. Such a platform would allow to interrogate some 10^16 nuclei at the same time, which is an enormous boost in signal strength. The isomer transition is expected at a wavelength in the VUV spectral range. Today, the tunable, narrow-linewidth, high-power cw lasers required to drive the transition do not even exist. The development of such lasers is a formidable task, and once they become available, they will find a wide range of applications, ranging from optical spectroscopy in the VUV to wafer inspection. The entire thorium research is centered about a nuclear system with an energy scale of a few eV. With such a setting, is seems obvious to connect to another prominent field of research: neutrino physics. The gamma detectors developed within nuClock, for example, will also be used in measurements of the neutrino rest masses. On a broader perspective, we will use the well-established techniques of optical spectroscopy on a nuclear system. For the first time, it will thus be possible to manipulate nuclei by laser light! 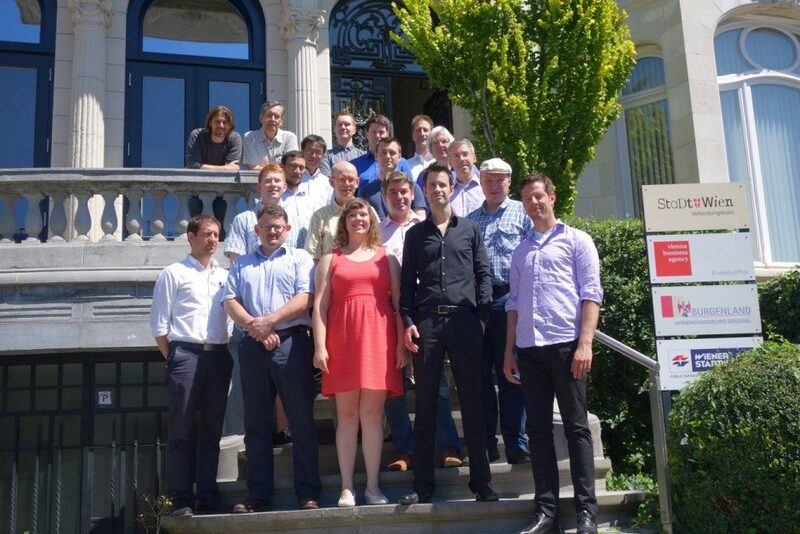 The consortium comprises eight European research groups with more than 20 people involved, having scientific backgrounds as diverse as nuclear physics, quantum optics, and laser development. Experimentalists and theoreticians, men and women, some very young and some very established: the consortium is a colorful mix of characters. There are people from Romania working in Germany, Germans working in Austria, and Brits working in Finland. Different as they are, they all share two common features: they are the world’s leading experts in their respective field, and they are excited about the thorium research. The consortium is led by the Vienna group. A presentation of the individual groups can be found by following the links below. 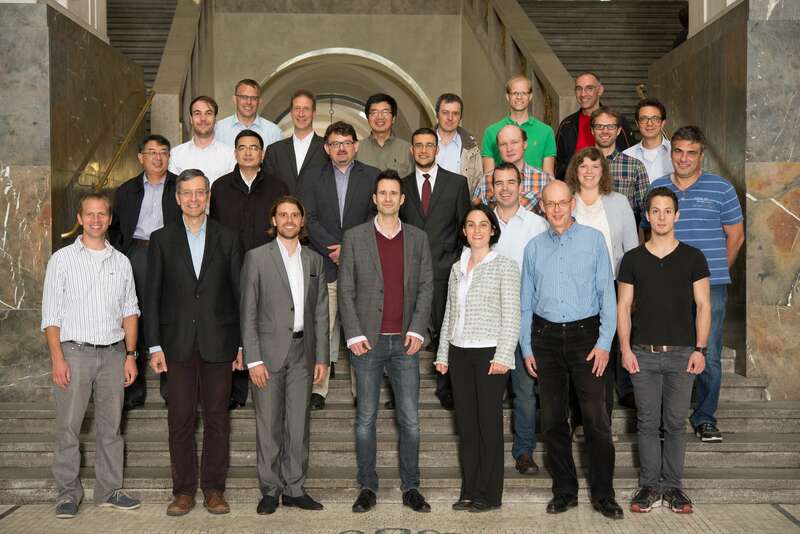 The nuClock consortium: kick-off meeting 2015 in Munich. Yearly meeting 2016 in Brussels. 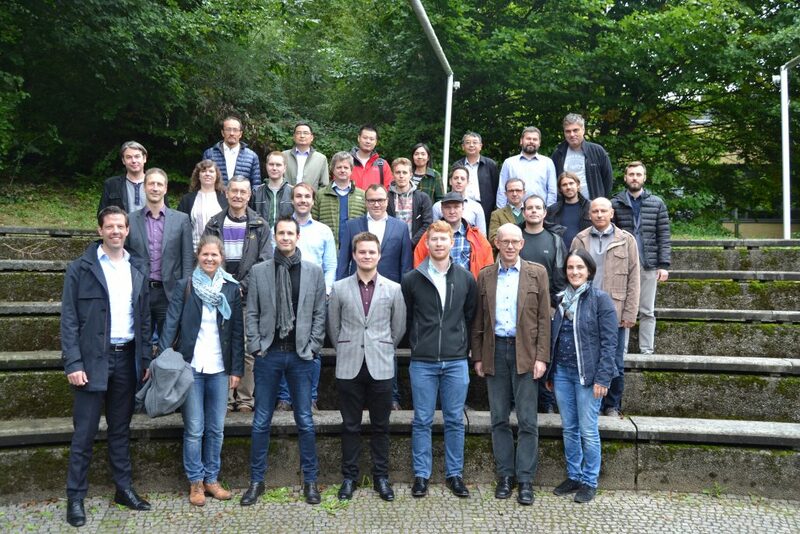 Group photo taken at the 2017 meeting in Heidelberg.